Xenon Light Sources – Optofine Instruments Pvt. Ltd.
We are Manufacturer, Supplier, Exporter of Xenon Light Sources and our setup is situated in Sangli, Maharashtra, India. 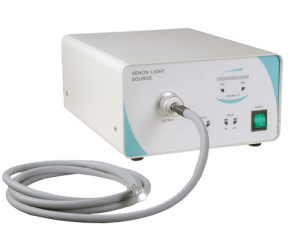 Xenon light cold light source, which is special source equipment for medical apparatus, as well as equipment matching a variety of endoscopic. When being used in the Clinical, the product can supply good illumination, imaging clearly for various endoscopic; the other hand, to provide good lighting for the doctors when examination, treatment, surgery and photography and video the organs in the body cavity. Xenon cold light source adopts advanced electronic control circuit switches to provide high-pressure short-arc xenon lamp with power.The source selects the spherical, high – pressure, short-arc xenon lamp as luminous body. In the circuit’s high press-trigger, makes light bulbs discharge point luminous between positive and negative electrodes. Have the entire spectrum light source from ultraviolet to infrared radiation, visible light color close to sunlight. The output with small ripple but ripple but constant current, make xenon lamp is with stable arc, high efficiency, and good color. To prevent other medical equipment in operations generated high frequency from interfering cold light’s normal work, during design, by adding a low- pass filter into the system in the end of entrance line of clod source, to enhance the overall stability, thus the camera work of clinical observation will obtain satisfied result. The strength of the cold light output is controlled by the touch switch on the panel. To ensure steady and reliable operation, using three fans in series cooling design, so cooling heat sufficiency to ensure the work stability. For this item, in the design and production, we are implementing the consistent of policies: the GB9706.1<< the First Part—-Safety General Requirements for Medical electrical equipment>> to guarantee the security.